Swallowtail butterfly enjoying my phlox. Here's one for you to paint Nancy, isn't it gorgeous, think I'll be a butterfly in this garden next time around! Thanks Ladies, love to hear your thoughts, appreciate it ! 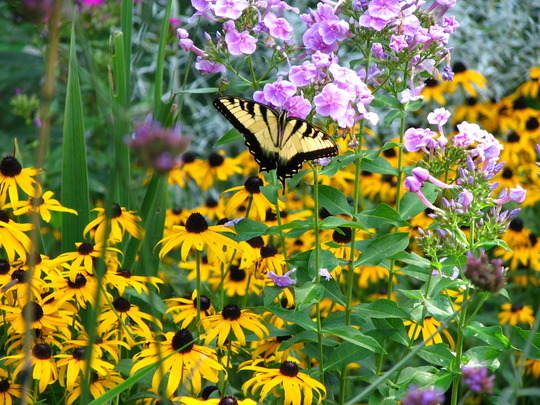 lovely swallowtail pic! envy you your lovely phlox!! Wish I could grow it! I love this pic. have decided to invest in some new cartridges and print it out for my bedrrom wall. Is that okay Flcrazy? I wish you weren't kidding..lol. But just for the sake of allowing myself to dream for a moment, I'll say... YES, please.....! Flcrazy, its a beautifull photo, Your too Modest Girl..:))) Dee.. Wonderful, when its done I shall show you a pic of your pic! Many, many thanks! Thanks Dee..., my hubby claims I'm too modest at times too, but I think he's referring to a different type of modesty, don't you...lol ! Brilliant picture, what camera are you using? Hubby was sweet enough to buy me a Canon PowerShot S3 IS for Christmas last year and I'm loving it. It should keep me entertained for many years, I'm afraid I'll never get all it's features mastered , but I plan on having fun trying anyway ! This is a beautiful photograph Flcrazy! Thanks for the comments Andy and Jill and, Tasteyg. It encourages me to try and top the last one. When my close-ups looks like yours, Tasteyg on a regular basis, I will be satisfied ! Yes loverly pic. I wish i could get chance to shoot a swallowtail. Thanks ladies, luck was finally looking my way...lol. Can't wait to see all of your wonderful posts ! This site is really growing fast, it might take me a while, but I plan on looking at them all ! My garden will probably never get weeded again though...lol. A stunning photo and a magnificent colour combination with the planting scheme. I agree with Grenville. A beautiful picture/plant combination. Thanks Gg ! I don't know why, but this is one of my favorite photos I took in 2008.